THE MOMENT YOU MEET YOUR BABY, YOUR LIFE WILL BE FOREVER CHANGED. Offering beautiful, tasteful documentary-style newborn birth photography coverage as your baby makes their way into this world. As a mother myself, I can unequivocally say that the day my daughter was born changed my life and my story forever. The anticipation, the love, the pain, the joy, the tears, the laughs, the hugs, the kisses... "oh, my gosh, she's here!" and instant sobs of elated happiness in my birth suite. Life as I knew it was completely different, in an instant. The way my husband proudly looked at his beautiful daughter, the way my mother choked back smiling sobs of joy... the way my daughter's 8 lb. body felt against my chest. I get to relive those moments forever and I wouldn't trade those images for the world. I serve birthing mamas throughout the Twin Cities who want to preserve these incredible memories. As a professional birth photographer, I have nearly a decade of photojournalism experience -- not only will I take stunning photos for you, but my presence will allow you and your family to be present before, during and after the birth, one of the most life-changing and incredible experiences in the world. 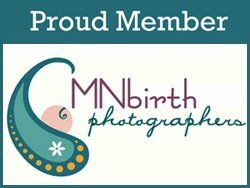 My clients birth at locations throughout the Twin Cities and the greater western suburbs -- Minneapolis, St. Paul, Maple Grove, Buffalo, Waconia, Chanhassen, Chaska, Minnetonka, and more. INQUIRE TO RESERVE YOUR SPOT ON MY CALENDAR. ALSO BOOKING "BABY'S FIRST DAY" SESSIONS! OPEN AVAILABILITY - CONTACT ME TO BOOK! WHY CHOOSE PROFESSIONAL BIRTH PHOTOGRAPHY? Professional birth photos are an incredible keepsake for you and your family. Oftentimes, Dad or Grandma is left holding a camera and preparing to take dimly-lit images of THE most powerful/emotional/life-changing experience you'll ever encounter. Or maybe you forgot the spare camera battery or memory card... I believe that you and your loved ones should be PRESENT and leave the life-altering image-taking to me! I am "on-call" from 38 weeks onward will be present with you in your delivery room, birth center or home during your active birth (active contractions and awaiting the birth) through 2 hours post-partum as you and your loved ones get acquainted with this sweet little baby of yours. all birth stories receive a complimentary mini maternity session! My documentary style of birth photography centers around the emotions, strength, and relationships throughout the process. My images are tasteful and beautiful and are not meant to be graphic in nature (unless you specifically request more graphic images). I have been blessed to be invited to share in THE most incredible, memorable and life-changing events of my clients lives. They are no longer just clients, and I am no longer "just the photographer".... I love my clients, my clients love and support me and and my business, and treat me like family. For half a decade, my husband and I have exclusively been trained as wedding photographers -- ok, how does that help you? I am highly trained in the art of anticipation. Not only do I know how to anticipate incredible moments, but I am an expert at finding the right light, documenting the events as they happen and providing you with unbelievably beautiful images of the most important times in your life. And when you and your hubby are busy concentrating, pushing, breathing, and waiting.... I'll be there. I am a silent participant in this beautiful moment as your baby takes their first breaths, as daddy leans forward to kiss mama's forehead... as "big sister" meets her new sibling for the very first time. I will always be your "primary" photographer for your birth experience -- Nathan is always available in the event that I is not (ie- another birth). Don't settle for cell phone photos. And let your loved ones be present. Leave the storytelling to me. I promise that you'll absolutely love your birth story. I can't wait to meet you! Discuss your intended birth location, birth plan and exchange of contact information (both yours and mine). Once I arrive, I will begin to document your birth experience. Every birth is different, and I will use my professional judgement on when/where/how to take photographs to tell your story. This is "documentary-style" coverage... this is not a posed portrait session. Once your baby has arrived, we will take some lifestyle-oriented portraits. "First family photo", baby meeting sibling(s) when applicable, meeting grandparents, etc. Many clients opt to add an additional "Meet the Baby" session during daylight hours when siblings, family + friends meet baby for the first time. Sneak peek images within 24 hours; all images will be available within 7 days and delivered via online gallery and can be downloaded. Any prints may be ordered from the online gallery as well. Ready to connect? Say Hello! Not sure about a birth photographer? I would still love to tell the story of your baby's first day! Sometimes called "Fresh 48" sessions, these documentary-style photo sessions are ideal within the first 24-48 hours after birth, when baby is still brand new. There are so many details you'll want to remember.... The fine, peach-fuzz baby hair. Baby's adorable, wrinkled baby rolls. The expression on your older daughter's face when she meets her new baby sister for the first time. The tears of joy that grandma cries when she meets her grandbaby for the first time. Once your new baby arrives, I will join you at the hospital (or birth center, or at home) within 24 hours (the earlier, the better!). We will spend 1-2 hours together and I will document many details, large and small, of that life-changing day. These are precious moments, and I cannot wait to document them for your family!